What do you know about someone? Someone close. A friend. A loved one. You know only what they want you to know. Nate Selegman’s friend, Wilson Montgomery, a.k.a., Turtle, was a piece of work. He was a lying, conniving, self-servingjerk. And someone murdered him. And enjoyed doing it. The cops have no leads and no suspects. Nate decides to find out what happened to his old friend. The more he discovers the less he knows. One thing becomes clear. The Turtle he thought he knew was someone else. The Turtle he uncovers plunges him into a world of crime, double-dealing, blackmail and murder. Trust is expensive, and his life, it turns out, is cheap. Featuring a stunning cover by Bruckner and print formatting and logo design by Percival Constantine, ‘Shell Game’ is available now at Amazon at http://www.amazon.com/gp/product/1517458471?keywords=shell%20game%20bruckner&qid=1445296962&ref_=sr_1_1_twi_pap_1&sr=8-1 and Pro Se’s own store at www.prose-press.com for 10.00. 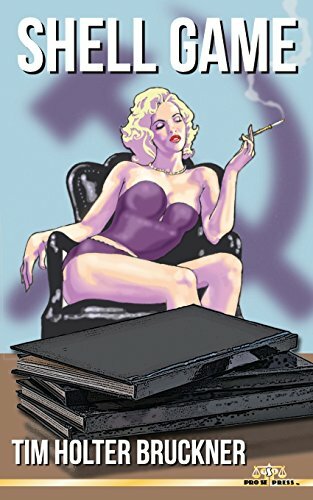 Bruckner’s latest digest novel is also available as an Ebook, designed and formatted by Forrest Bryant and available for only $2.99 for the Kindle at http://www.amazon.com/Castle-Dark-Nicholas-Boving-http://www.amazon.com/Shell-Game-Tim-Holter-Bruckner-ebook/dp/B016QOJJ82/ref=tmm_kin_swatch_0?_encoding=UTF8&qid=1445296962&sr=8-1 and for most digital formats via Smashwords at https://www.smashwords.com/books/view/585524.